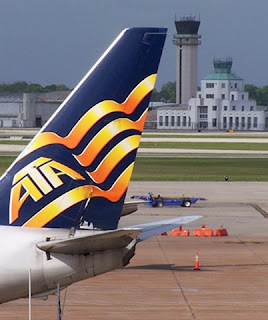 ATA Airlines last night filed a petition for Chapter 11 bankruptcy protection and this morning discontinued all of its operations. ATA said an "unexpected cancellation" of a military charter contract, provided through an agreement with FedEx, dried up its capital and necessitated the stop in service. ATA said it no longer would honor reservations, has canceled all frequent flier benefits and has eliminated positions for the vast majority of its 2,230 employees. ATA alerted customers holding reservations purchased with a credit card to contact their credit card company for refunds. The carrier said booked passengers should "seek alternative arrangements for current and future travel. To that end, ATA has contacted the airlines that serve ATA destinations and asked them to provide assistance to ATA customers." ATA said a decades-old teaming agreement with FedEx comprised the bulk of its charter operations. However, ATA said FedEx alerted the carrier that it is dissolving that contract for the next fiscal year. "This termination is a full year earlier than the term specified in a letter of agreement between FedEx and ATA," ATA said in a statement this morning. Prior to the military contract cancellation, ATA had been in a financial tailspin, attributed in part to the growing cost of fuel. The carrier last month announced it would cease domestic scheduled service at Chicago Midway Airport on April 14 and international service from that airport on June 7. "All such service has been discontinued immediately, in addition to all of ATA's other scheduled flights, which operated between the West Coast and Hawaii," ATA said today. ATA COO Doug Yakola in a statement said, "We deeply regret the disruption and hardship caused by the sudden shutdown of ATA, an outcome we and our employees had worked very hard and made many sacrifices to avoid. Unfortunately, the cancellation of a critical agreement for our military charter business undermined ATA's plan to address the current conditions facing all scheduled service airlines, including the tremendous spike in the price of jet fuel in recent months. As a result, it became impossible for ATA to continue operating."